The core of my research concerns pre- and post-Conquest England, with special attention to the intersection of literature and other visual, material and media modes of cultural expression – e.g. maps, tapestries and sculpture, and, most recently, more ephemeral and abstracted aspects of early medieval expressive production – auditory culture, technological alteration of bodies, transliteracies and ecologies of media forms, and the process of temporal decay or obsolescence. Recent work includes essays on widows, witchcraft and medieval real estate deals (2018), medieval media, human bodies and digital technology (2017) media archaeology and manuscript studies (2015), a sensual philology for Anglo-Saxon England (2014), “Media” for the Wiley-Blackwell Handbook of Anglo-Saxon Studies (2012), as well as co-editing a volume of articles on “Becoming Media” for the journal postmedieval (2012), for which submissions were also vetted through an experimental online crowd review. I am currently at work on a book on the nature of early medieval media, as well as editing a set of early medieval maps for the Virtual Mappa project, based at the British Library. Major publications include the Bayeux Tapestry Digital Edition (2003 & 2013), Virtually Anglo-Saxon: Old Media, New Media, and Early Medieval Studies in the Late Age of Print (2007), and Bayeux Tapestry: New Interpretations (2009). I also co-direct the DM Project, a digital resource for the open annotation of digital images and texts, which has been funded by a multi-year grant from the National Endowment for the Humanities, with earlier support from Andrew W. Mellon Foundation, and by a generous UW2020 grant from the University of Wisconsin-Madison. “Recalling the Medieval: Stained Glass, Longboards, and Rain” – Closing Remarks of the Executive Director for the 2017 ISAS Meeting, University of Hawai’i, Manoa August 4, 2017 (2,500 words). “The Undoing of Exeter Book Riddle 47: ‘Bookmoth’,” in Transitional States: Cultural Change, Tradition and Memory in Medieval England. Ed. Graham Caie and Michael D.C. Drout. Tempe: Arizona Center for Medieval and Renaissance Studies (ACMRS), (forthcoming 2018, 12,500 words). “The Anonymous, Executed Widow of Ailsworth,” for Anglo-Saxon Women: A Florilegium, ed. Emily Butler, Irina Dumitrescu, and Hilary E. Fox (forthcoming, 1200 words: 2018). “The Remanence of Medieval Media,” for Digital Medieval Literature and Culture (Routledge Handbook series), ed. Jen Boyle and Helen J Burgess (Routledge: 2017), 9-30. “Redacting Harold Godwinson in William of Malmesbury’s Gesta Regum and the Vita Haroldi,” in Textiles, Text, Intertext: Essays in Honour of Gale R. Owen-Crocker, eds. Jill Fredrick and Maren Clegg-Hyer (Boydell and Brewer Press: 2016), 239-53. “Hwæt sprycst þu? : Performing Ælfric’s Colloquy.” Studies in Medieval and Renaissance Teaching 22.2 (Fall 2015) (special issue: Practical Strategies for Teaching and Learning Old English), ed. H. Momma and H. Estes, 66-71. “Medieval Manuscripts: Media Archaeology and the Digital Incunable,” for The Medieval Manuscript Book: Cultural Approaches, eds. M. Van Dussen and M. Johnston (Cambridge University Press: 2015), 119-139. “A Sensual Philology for Anglo-Saxon England.” Postmedieval, 5.4 (volume on Philologies and the Futures of Humanism) (2014): 456-472. “The Piers Plowman Electronic Archive and the Process of Durable Mutation” (review essay). Yearbook of Langland Studies 26 (2012 ): 277-286. “Media: Some Definitions Disguised as Maxims” & “Media in ‘The Husband’s Message’.” A Handbook to Anglo-Saxon Studies (Critical Theory Handbooks), ed. Jacqueline A. Stodnick and Renée R. Trilling (Oxford: Wiley-Blackwell), 2012, 133-148. “Developing Digital Mappaemundi: An Agile Mode for Annotating Medieval Maps” (with Shannon Bradshaw). Digital Medievalist 7 (2011). “Vanishing Transliteracies in Beowulf and Samuel Pepys’ Diary” (with Whitney Trettien). Essays and Studies –‘Textual Cultures: Cultural Texts,’ ed. Elaine Treharne and Orietta Da Rold (Woodbridge: Boydell and Brewer), 2010, 75-120. “New Media and the Nunburnholme Cross.” Cross and Cruciform in the Anglo-Saxon World, ed. Karen Jolly, Sarah Keefer, and Catherine Karkov, (Morgantown: West Virginia University Press), 2010, 340-368. “Pulling the Arrow Out: The Legend of Harold’s Death and the Bayeux Tapestry.” The Bayeux Tapestry: New Interpretations (2009, see below), 158-175. “The Reality of Media in Anglo-Saxon Studies.” The Heroic Age; A Journal of Early Medieval Northwestern Europe 11 (2008). “An Unfinished Mappamundi from Late Eleventh-Century Worcester: CCCC 265 and the Evidence for a Family of Late Anglo-Saxon Maps.” Anglo-Saxon England 35 (2006): 271-284. “The Virtual Reality of the Anglo-Saxon Mappamundi.” Literature Compass 1 (2003): ME 016, 1-14. “All’s Well that Ends: Closure, Hypertext, and the Missing End of the Bayeux Tapestry.” Exemplaria 15.2 (2003): 39-72. Digital Mappa (DM for short) is an online environment for the collection and curation of digital images and texts. DM’s suite of tools enables users assemble digital materials (both image and text), and then highlight areas of interest specific areas of interest on these documents. These highlights are then active, and users can create commentary for them, or link between them and other highlight on the same or other documents in the same DM project. Please note: for this current beta version of DM, using Chrome as a browser is required. Virtual Mappa Project (with the British Library): the original research initiative that led to the development of the DM Toolset. VMP is a case study in how medieval maps of the world and related geographic texts may be collected, annotated and networked, and includes maps from both the British Library and the Parker Library (Cambridge University). VMP is a substantial partnership with the British Library to develop this project into a truly interoperable resource that can virtually collect and display content drawn from several digital repositories. Previously funded by a multi-year ($250,000) NEH Digital Humanities Implementation grant. The Old English & Anglo-Latin Belltokens Project is a showcase mini-edition of a short Old English text that also survives in a Latin version. This is a digital scholarly project unique in its design and content. At its center are two texts: a piece of Old English prose from the eleventh century, partly erased, of some forty-five lines, that itself is a direct translation of a late tenth-century Anglo-Latin version of the same content. The material concerns the allegorical significance of the ringing of church bells, derives from a redaction of a redaction of the Liber Officialis, a massive ninth-century treatise by Amalarius of Metz which allegorically treats a vast range of objects and rituals related to the celebration of Mass. The Belltokens Project offers entry into the evolution of material in Anglo-Saxon England from a number of scholarly and pedagogical perspectives of content, text, language, manuscript and paleography. The Four Anglo-Carolingian Mini-Editions is an edited project of four short texts held in the British Library’s Vespasian MS D.xv, which is at present a combination of two sets of medieval English texts from two different periods – the mid-twelfth century, and the late-tenth century. The manuscript begins with a twelfth-century pontifical; the rest of the manuscript dates from the sometime after c.970-975, very likely from Worcester, and consists first of a penitential manual containing works by Isidore of Seville and St. Jerome, another handbook for penance known as the Canones Cottoniani that is an adaptation of a Paenitentiale Theodori. This edition was not planned or expected. In the process of working on the Old English Belltokens edition noted above, cursory research led to surprising discoveries, all of which have subsequently been produced as mini-editions. Best New Journal 2012, by the Association of Learned and Professional Society Publishers (ALPSP). In media studies circles, it is now almost trite to discuss the term remediation: the liminal, ambivalent staging of a media life caught between older and newer forms, and the functional tussle that happens between them. Nevertheless, scholars today work within this oscillating, in-between space – a space fraught with cross pressures of how we used to do things and how we ought to do things. As (post)medievalists, we study the very old with the very new, but remain constrained by the cultural logic of earlier and increasingly archaic media production. 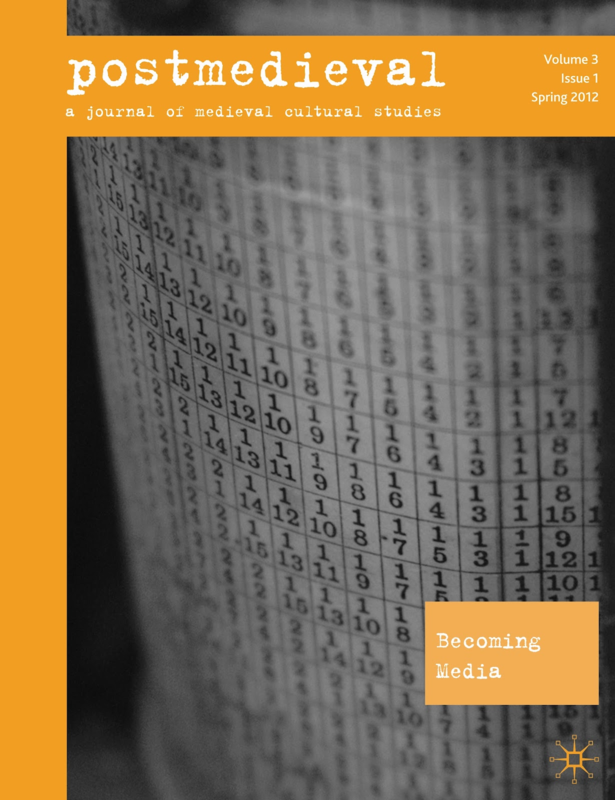 So the theme ‘Becoming Media’ applies as much to the entire process of this issue and its own immediately historical context as to its organizing theme and published product – a product realized here traditionally in print and then again, digitally and differently, on postmedieval’s website. This process has been in many ways a stochastic one, infused with prediction, probability and randomness. We guessed about the new as we studied the old: the form and function of the online crowd review for early drafts of our contributors’ essays necessarily developed out of the moment, as there was relatively little precedent for how such a process would or should work. We experimented with alternatives to the standard modes of publishing scholarship, even as we here produce such scholarship in such modes. Martin Foys (Co-editor), Karen Overbey (Co-editor), Dan Terkla (Co-editor). The Bayeux Tapestry: New Interpretations. Boydell and Brewer, 2009. 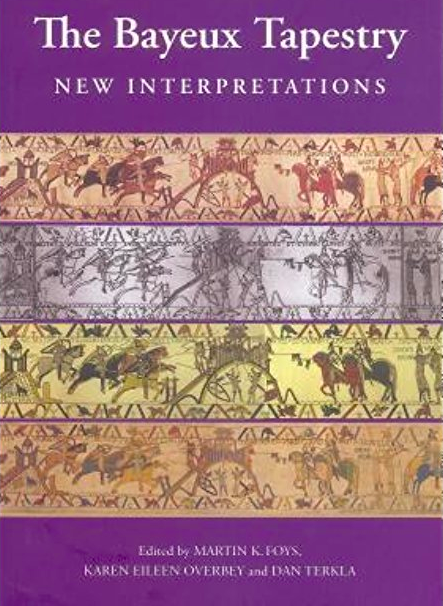 In the past two decades, scholarly assessment of the Bayeux Tapestry has begun to consider issues beyond its sources and analogues, dating, origin and purpose, and site of display.” “This volume demonstrates the utility of more recent interpretive approaches to this famous artefact, especially with regard to newer concepts of gender, materiality, reception theory, cultural criticism, performativity, spatial narrative, New Historicism, and post-structuralism.” “The essays frame vital issues for the future of Tapestry scholarship: they provide original perspectives, and engage with myriad critical concerns: the (New-) historical layering of meaning, representational systems of gender difference, visuality, memory and architecture, modern obsessions with author-like patronage, post-colonial notions of territory and saintly relics, and the function of historiography and media.” “A bibliography of three centuries of critical writings completes the work. Martin Foys. 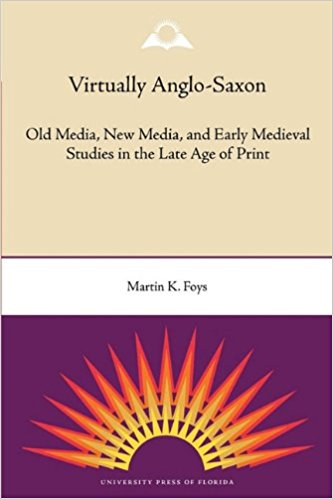 Virtually Anglo-Saxon: New Media, Old Media, and Early Medieval Studies in the Late Age of Print. University Press of Florida, 2007. 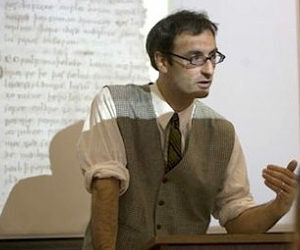 Foys argues that early medieval culture did not favor the representational practices privileged by the modern age and that five hundred years of print culture have in effect shut off modern readers from interpretations of text and image that would have been transparent to a medieval audience. Examining print and post-print ways of reading medieval literature and art, he derives alternative models of understanding from the realm of digital media, considering pre-print expression through a range of post-print ideas and producing new and vital understandings of visionary Old English poetry, Anglo-Saxon maps of the world, 11th-century Benedictine devotional writings, medieval mathematical systems, stone sculpture of Viking settlers, and the famous Bayeux Tapestry. Building chapter upon chapter into a sustained discussion of New Media theory and medieval interpretation, Foys provides a field-defining investigation of how digital technology and expression can refine and revitalize early medieval studies. Martin Foys. 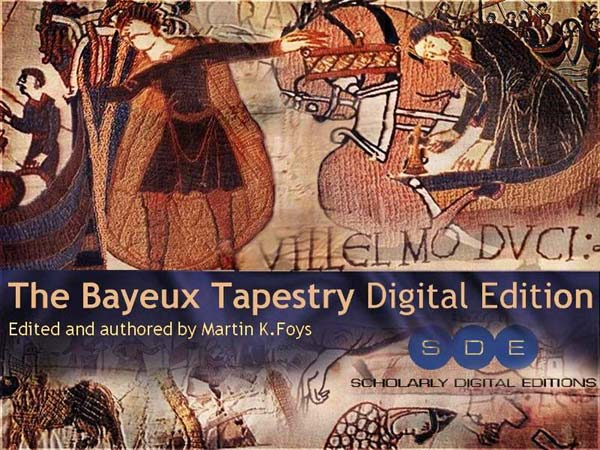 The Digital Edition of the Bayeux Tapestry. Boydell & Brewer/SDE, 2003. “The Bayeux Tapestry presents its story of the Norman Conquest of England in words of such simplicity and images of such power that it has long determined the view we take of the momentous events of 1064-6. This digital edition creates new and exciting ways of viewing the Tapestry, with additional features in the form of a brilliantly-conceived array of supporting material. It transforms the way in which students and teachers alike will be able to approach, to use and to enjoy one of the most remarkable of all our sources for the middle ages.” – Simon Keynes, Elrington and Bosworth Professor of Anglo-Saxon, University of Cambridge.